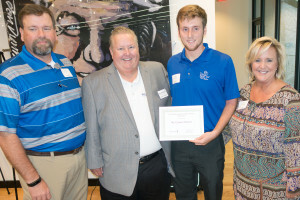 May 21, 2015 – At the Ben Hogan Breakfast Club on Thursday morning it was announced that Mr. Conner Parish will receive the Foundation’s third full scholarship. In partnership with Texas Wesleyan University (TWU), this scholarship pays all the books, fees, and tuition for Conner for four years given his academic performance is strong and his conduct proper. The Foundation’s Executive Director, Mr. Robert Stennett, will serve as Conner’s mentor as he pursues his degree from TWU.